Welcome to the International Danube Art Master competition! Once again, the Danube rivers have proved to be a great inspiration for young people to voice their concerns about rivers. Over a thousand children from 140 schools and clubs located across the Danube Basin answered our creative challenge in 2018. The 14-country art extravaganza tasked them to create a riverside artwork from materials found by the river or a 1-minute video expressing why rivers are important, related to the theme Get active for a healthy Danube! You can see some of the resulting videos and artworks on facebook, where you can also take part in voting for the most popular international video by 'liking' your favourite. National Art Masters now wait to hear who will win the top prize to be crowned the International Danube Art Master for 2018! The announcement will be made on facebook later in the year. If you or your school are inspired to create art for the Danube, details of how to enter the 2019 competition will be available here in spring 2019. You might end up being crowned Art Master for your country and win a great prize! In the meantime, you can read more about the competition on last year's competition factsheet or visit the website of co-organisers, Global Water Partnership where information is available in national languages. The latest competition news will also be posted on facebook. Or, if you need more inspiration, check out the gallery and video below, showcasing the annual competition. Students from Ilidža in Bosnia-Herzegovina have been crowned the international Danube Art Masters for 2017, being placed first in the 13-country final! Congratulations go to the children from the Sixth School in Ilidža, Sarajevo, and to the competition organisers in Bosnia-Herzegovina, Ekotim! The pupils' ingenious creation, entitled “Bridge – rivers connect people and bridges connect their riversides”, was constructed from plastic bottles and plaited bags. Traversing a Bosna tributary, the artwork emphasized not only the river's role in linking people, but also the pollution pressures that rivers face. The winners were announced in October 2017 at the House of the European Union in Vienna by Susanne Brandstetter, Chairperson of the Public Participation Expert Group of the ICPDR. Second Place went to Hungary with “Give me a hand”, a work made from sand, glass debris and plastic waste showing a hand reaching out of the waste created by Gréta Melinda Gats, a pupil at the Szombathely Arts High School in Szombathely. The third prize went to Croatia with “Eco Patrol” by a group of pupils behind Slatinik Drenjski from PO Slatinik in Drenje. The Award Ceremony was held on Wednesday, 13 December during the 20th ICPDR Ordinary Meeting in Vienna. The top three winners of Danube Art Master 2017 received their Awards from ICPDR President Peter Gammeltoft and Chairperson of the Public Participation Expert Group, Susanne Brandstetter in the presence of the Heads of delegation of 13 Danube countries. The EU Commission and all ICPDR observers congratulated the young representatives from Bosnia and Herzegovina, Hungary and Croatia for their great art. The first winner of the Danube Art Master video category Denis Savchenko received a special award by the ICPDR. It was handed to the Head of Delegation from Ukraine and will be delivered to Denis. Each year, the Danube Art Master contest challenges children living in the Danube Basin to create sustainable works of art dedicated to their rivers. New for 2017 was a special category for young film-makers: create a 1 minute video capturing your hopes and dreams for your river. National Art Masters were selected in each country, and then went through to the international round of the competition in Vienna. Video showcasing the Danube Art Master at the 2016 ICPDR Ministerial Meeting. Jointly overseen by the Global Water Partnership Central and Eastern Europe (GWP CEE) and the ICPDR, this ambitious contest encourages children to visit their local rivers and create art reflecting what the Danube means to them. By entering the competition, they not only have a great time making their creations but are motivated to consider the future of the rivers and the people and wildlife that rely on them. The result is a visual representation of young people's vision for the Danube Basin. Running since 2004, the competition has resulted in tens of thousands of artworks lining rivers across all 14 countries. 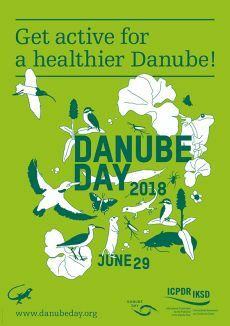 Each creation is an expression of children's passion for their local river: whether demonstrating their Danube solidarity, environmental concern, hopes for the future, or the simple pleasures to be had from spending time near rivers. Organisers of the international competition took a break in 2016 to focus efforts on relaunching the contest in 2017. Nonetheless, Slovenia, Serbia and Moldova ran national rounds: see Review 2016. 2015 saw Iman Maljić from Bosnia-Herzegovina scoop the International Danube Art Master crown. Over 1300 children from 11 countries rose to the 2015 challenge to design gowns fit for a Grand Danube Masquerade, made only from materials found by their rivers. To browse more of the 600 marvellous creations, see Flickr and Facebook. Browse the gallery below to get a taste of how the Danube rivers have inspired the region's children. For further information on the competition see Facebook and view previous years' entries on Flickr 2011, 2012, 2013, 2014 and 2015.